The latest Land Rover Discovery is every bit as good as we could have hoped for: comfortable, luxurious, spacious, amazing off road and reasonably priced. It's almost without weakness...until you see the back end. Ouch. Here's Mark's take on the whole thing. If you've not done so already, please take a moment to subscribe to the HJ YouTube channel by clicking here. Thanks a lot. Why do you continue to promote Range Rovers ,Evokes etc when they are one of the most unreliable vehicles sold in Europe ? 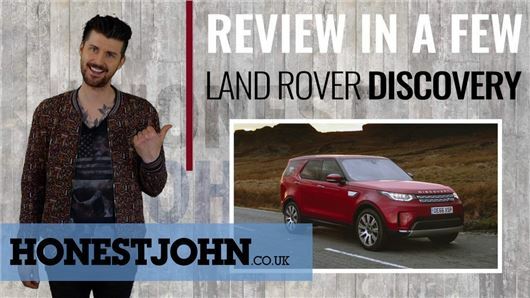 What makes it right to praise and promote cars from JLR which, as evidenced by your own reviews and reports, are notorious for being unreliable and v costly to own? he didn't mention the supercharged 3 litre petrol. It's also fantastic and quite fast - as the supercharger bit would imply. Petrol consumption is not too bad either around 22 mpg in town and 30ish on the open road. Of course, if you make full use of the s/charger these numbers fall a bit. To give some indication of JLR future, take a look at the results of a massive Consumer Report from the US, where LR is third from bottom and J is sixth from bottom. They need to start giving the car buyer something worth buying. Oh, and the Hyundai Genesis was in first place, beating Audi and all the rest of the overpriced German stuff. I don't mind road tests but I don't like personal opinions on styling. I actually like the rear of the disco its neat tidy and timeless IMO. But most LRs are filthy diesels. Avoid! I own an evoque.purchased new 28 months ago.build quality rubbish,broken down twice and had to call land rover recovery.each time they had to send AA as they were busy.car going in again in a couple of days for radio problems again,3rd replacement a pillar cover,drivers door lock cover fell off so new one to be fitted.ive had manny many trips to garage to fix i glycol problems. Well, who would have thought? If you want reliability (and value) you are almost obliged to buy an Asian-built brand - the euro brands are stylish without doubt, but more expensive, less reliable, and struggle with depreciation because of the first points. A small light on the horizon is the massive improvement that the French brands have managed over the last decade, and the Czech'Slovak auto workers are doing a good job too. Perceptions, once established, take a long time to re-adjust. German brands are now struggling with many issues, and that fateful public perception is turning negative (they (VW and co) just haven't realised it yet).